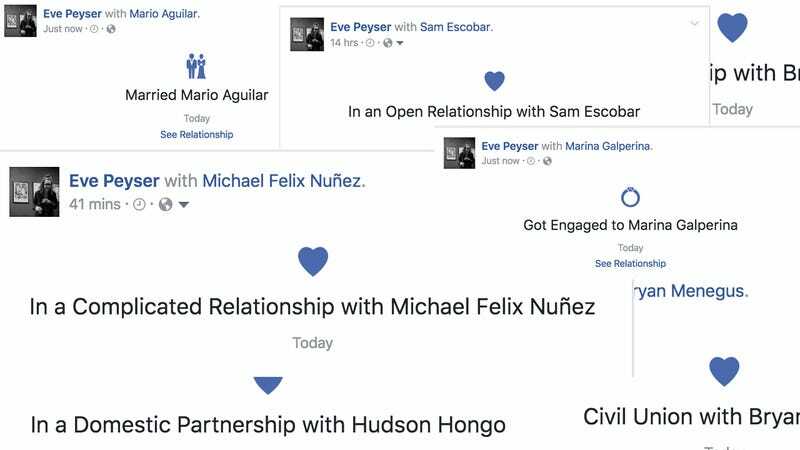 And yet, when I relationship requested Gizmodo technology editor Michael Nuñez—a move completely inappropriate for the workplace, something I hoped would stay between Mike and me—it immediately blasted my entire newsfeed, announcing our (complicated) courtship to all our mutual friends, including our superiors. It cropped my face out of my profile picture so it sort of looks like my friend Eric is in a relationship with Mike. I wish them the best. Facebook’s disclaimer is, if anything, misleading. Mike still has to approve the post for it to show up on his profile and blast his newsfeed as well. But his profile was still tagged in the post, plus my posts are public, meaning the whole world can see. We have reached out to Facebook about why this works this way, we’ll update the post if we get a response. The very second I pressed the button, the relationship was publicly displayed on my profile and was all over my friend’s newsfeed. I did it pretty late one night and my girlfriend was already asleep, so the next morning she woke up to a series of frantic, apologetic text messages from me explaining myself and how I assumed she would have been notified first. I thought it would be a cute thing for her to receive the request, and then we could chat about it and see if it’s something we’re both comfortable with making public. Is Facebook ruining romantic relationships is a question many a media outlet has asked? The answer, we can now see, is clearly yes. Although it will be there for you, when you finally break-up.